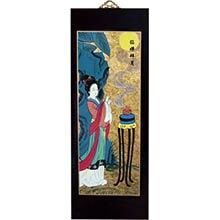 A young regal appearing Chinese woman is lost in thought as she stands in her palace. The rich-looking robe, flowers and curtain in the background suggest a sense of royalty about her. A young regal appearing Chinese woman is lost in thought as she stands in her palace. The rich-looking robe, flowers and curtain in the background suggest a sense of royalty about her. 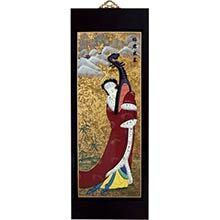 On the left side of the carving is a striking gold background color that adds a beautiful look to the image. 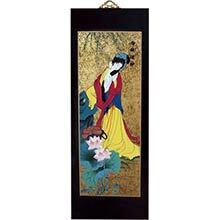 Place this lovely Asian wall carving on your wall for a great look and superb decor. Only one of this piece left in stock.